"Great with london broil or any meat. Delicious with potatoes as well!" Preheat an oven to 300 degrees F (150 degrees C). Cut off the top of the head of garlic to expose the cloves, trimming about 1/4 inch off of the top of each clove. You may need to trim individual cloves along the sides of the head. Brush the cut cloves with a small amount of olive oil, then nestle the head into a piece of aluminum foil. Bake in the preheated oven until the cloves are tender and nicely browned, about 1 hour. Remove, and allow to cool to room temperature. Once cool, squeeze the garlic cloves out of their skins and into a mixing bowl. 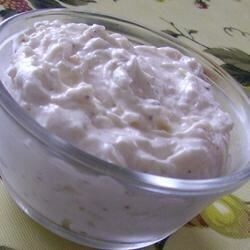 Mash well with a wire whisk, then add the sour cream, mayonnaise, green onions, vinegar, salt, and pepper. Whisk until evenly blended, then refrigerate 2 to 4 hours to allow the flavors to blend. Fresh, creamy & garlicky goodness! I thought the sour cream and mayo really hid the rich garlic flavor. I would add less of those and let the garlic make more of a statement flavor that you would expect from a garlic dip. EXCELLENT!!! I forgot the green onion when I went shopping .... and it could only improve on the already great flavor, many thanks for this great recipe! I used balsamic instead of Wine vinegar. It was so good. It adds a nice tang. This is AMAZING!!! I didn't have sour cream on hand so I used plain yogurt. It turned out so yummy and can only imagine how much better it would be with sour cream. Made as written for my SIL 40th b-day and she LOVED it! !